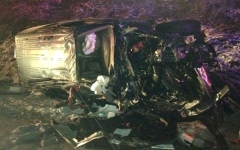 A van is heavily damaged along Interstate 81 North bound Sunday evening. Both passengers in the van were ejected leaving one dead at the scene and one in critical condition. Photo and caption courtesy of Frank Adruscavage from Republican Herald. At about 9:15 p.m., a helicopter descended onto mile marker 135.3 to evacuate the surviving accident victim and lifted off approximately 9:45 p.m. in the direction of Reading Hospital where the person remains in critical condition. The identities of either victims have not yet been released. The shoulder of I-81 was announced clear at 10:18p.m., but traffic was still at a standstill for an additional two to three hours.